Our stunning infinity bracelet is a perfect gift for a bride or bridesmaids on a special wedding day. A beautiful sterling silver trace chain winds into a shimmering infinity cubic zirconia clustered shape that is the perfect symbol for love. It will make a gorgeous accessory to the bride's wedding dress and is such an appropriate gift for a bride to receive on her wedding day. 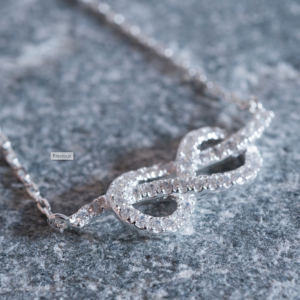 This bracelet is a perfect match to our Infinity Cubic Zirconia Necklace, please see accessories below. This gorgeous gift comes in a stylish grey gift box which can be personalised with a solid silver brass engraved nameplate attached to the lid; you can make it an extra special keepsake by engraving your own personal message. We can engrave up to 75 characters over 3 lines.